In Fareham, this geared Alpha 3 and its partner on the other side of the forecourt are about to be pulled down. The site is being demolished, originally an Elf petrol station, that closed in the 1990s, the site had been laterally used as a 2nd hand car sales site. The Alpha 3s used to run mercury and still worked a few years after the petrol station closed. They have however now been out of use for decades. In November the Portsmouth LED upgrade will move into Zone 3. When Zone 3's replacements are complete by Christmas, it should be the case that all side roads on Portsea Island with 'functional' street lighting will have been upgraded, and LED will start to be visible on mainland side roads. It will be interesting to see the effect from up on Portsdown Hill. Moving into 2019, replacements will continue on side roads on the mainland, and following this main roads across the city will start to be upgraded to LED. Heading into Portsmouth last night, I couldn't help but notice that the replacements haven't been totally thorough. There are a few roads and footpaths about in zones that have had replacements which still have their old lanterns. The idea was that they did replacements in all the zones then came back to do main roads across the city, but they will need to do the loose ends too. 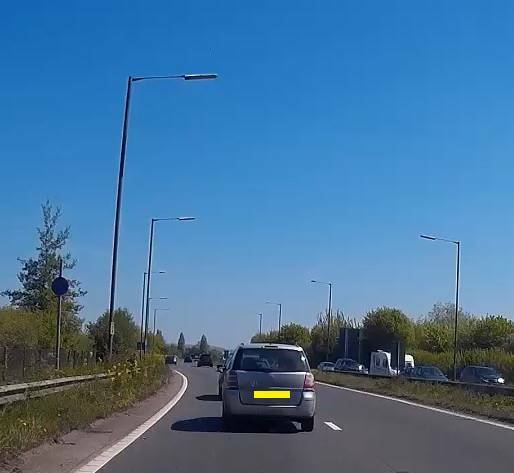 Sometime in the last year, Herts started to use Axia 2's instead of Ampera's for LED replacements. Still, if new stock isn't available, they sometimes source an orphaned SOX/SON lantern that had been previously been culled as part of the programme, to act as a stand-in until the street is scheduled to receive new lanterns. Swanmore Parish in Hampshire are most of the way through a LED street lighting replacement programme with Zeta SmartScape Nano lanterns. This replacement programme saw the culling of a good amount of mercury installed in GEC Z8831 lanterns. As of this week, LED replacements have finally reached my no-through street in West Herts, which had previously been a mix of SOX P178's, XGS103's and a couple older post top lanterns, plus a rogue MBF P178 fitted with a SON-H lamp. The concrete columns now have steel sleeves installed. As of today there are only a couple SOX P178's left. Elsewhere in my area, older light sources are decimated. Chorleywood Close in Rickmansworth (ex. mainline A404), as of the Sept. 2018 GSV pics, still has a pair of old concrete columns with curved brackets and elderly SOX lanterns. I seem to remember that this area will be one of the last to see Phase 4 of Herts upgrade programme, so the lights should still be there now. At Chichester, the shocking state of repair of lighting on the A27/A259 roundabout seems to be improving. Most of the cut down/demolished columns on the roundabout itself have been replaced with new aluminium columns with Phosco P860 LED lanterns. The columns just west of the roundabout also now have P860s. A27 south coast trunk road used to be exclusively lit by SOX, but its practically all gone. There is none left in Hampshire, but in West Sussex, a small section east of Chichester, by the Portfield roundabout still survives. Further east at Worthing its all gone as well, except for this MA60 which has escaped, probably helped by the tree. Well, all but of one of those SOX lanterns in the picture have now gone, replaced by 2nd hand ZX3s, and the MA60 at Worthing has gone as well. A very weird situation here at the Colney Hatch Lane turn-off of the A406 in North London! It seems that we have LED LANTERNS BEING REPLACED BY SON!